Book your selected cruise, and begin your experience with pickup from your St. Petersburg hotel. 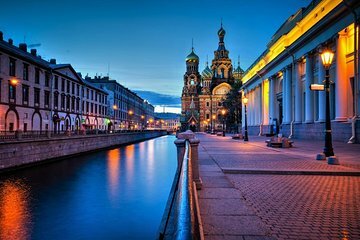 Then, board your boat and sail along the city's main river waters, including the imperious Neva River, passing many of the most beautiful and famous landmarks along the way. After your cruise, return ashore and enjoy a drop-off on foot either at your hotel or a central location. Choose from the regular departure times, and after your hotel transfer, settle aboard and take in the views along the ‘Golden Ring;’ the classic river and canal route around St. Petersburg. Sail on the River Neva for stunning views of the Peter and Paul Fortress and Spit of Vasilyevsky Island, and drift along the River Moika and canals by St. Nicholas Cathedral, the Mariinsky Theatre, Moika River Embankment, St. Isaac’s Cathedral, the General Staff Building, and more. Enjoy a midnight cruise around St. Petersburg’s waterways just as many of its floodlit drawbridges are raised. See all seven major bridges, watching as some, like the Palace Bridge and Troitsky Bridge, raise their wings to let riverboats pass. Absorb the vibrant atmosphere as boats and riverside crowds gather for the spectacle, and cruise along canals and the Neva River to admire St. Petersburg’s illuminated palaces and monuments. Take a walking tour around the historic heart of St. Petersburg as a prelude to your cruise along the beautiful Neva River, accompanied by dinner and live jazz music. Step aboard a paddle-steamer-style riverboat, and admire lit-up landmarks including the Hermitage, Peter and Paul Fortress, and Vasilyevsky Island, from the sightseeing deck and panoramic windows. As you cruise, savor a delicious gourmet dinner in the elegant dining room. Lovely tour this week. Walked from my hotel on the Moika up to the Fontanka and went on roads parallel to Nevsky Prospect, which was really cool to see different streets. I used them later with my family. I'm a really quick walker the poor guide so we also had enough time to pop into a photo museum as they have an amazing rooftop view of Nevsky Prospect. From the roof I even got a picture of a WW2 tram going along the street. Very cool. We also had time to go into the Elyseev Emporium again I took my family in the afternoon as I spotted some vodka in there that you cant buy in the UK. The boat trip went on a lovely route down to St Isaacs, then past my hotel on the Moika and out into the Neva. We then passed by the Summer Garden and Anichkov Bridge and back. Highly recommend. Had a fab time. Big thank you to Pauline. We were met in our Lobby by Kinsenia and walked 30 mins to the boat at 23:30. The boat did not leave until 00:30. The boat seamed not ready for us. All the chairs were stacked, wet with water and not urgency to make us feel welcomed. The covered boat area smells really bad like mildew and pretty sure the blankets you can borrow have never been washed. There are many other companies that have nicer boats that we saw that night. Boats that have bars to get drinks and snacks and are just plain nicer. Not sure why Viator supports this part - you need to pay 10 extra in USD per each person. Why isn't this just added onto the price you pay on Viator? Also it is recommended to have the boat company call you a taxi after the boat trip that ended at 2:00 not 3:00 like stated on Viator. This taxi and Kinsenia took us on a very long taxi ride that was clearly a large circle back to our hotel. My friend even asked the driver and Kinsenia in the car Didn't we just drive in a big circle? Of course they said not, but we did. I think they were trying to justify the 40 cab fee. Also, there was no taxi meter tracking the ride, they just want the cash and only USD. I think we totally were taxi scammed. I would look for another company that does the same thing. There were like 5 other companies on the water with us that night, so just do some more research and don't pick this excursion. I highly recommend this tour. There is nothing more beautiful then seeing St Petersburg by boat. We had the most wonderful guide, Maria Sorokina, who was such a joy. Every question we asked her about her life, St Petersburg, and Russia she answered for us. For such a young person she was very knowledgeable. She also went beyond the river tour and walked us around plus showed us places to eat. She definitely made the tour worthwhile! Our lovely guide Marta picked us up from the hotel at the appointed meeting time then took us, via the Metro, to the departure point of the River Boat trip. It took about half an hour to reach the departure point. The boat trip lasts roughly 90 minutes and passes in front of several well-known buildings in St Petersburg, sailing through the canals and the Neva river. Blankets are provided if the weather is cold, as it was when we did this boat ride, but there is an inside cabin if you feel really cold. It must be done after you have explored St Petersburg on foot, thus providing you with a further river view of the facades of these magnificent buildings. A word of warning though, the explanations provided on board the ship are in Russian and Marta was translating as we went along. However, as mentioned beforehand, if you visit the city before doing this boat ride, you will be able to recognise the buildings almost immediately. I would recommend doing it only if you still have a bit of time left and have already visited all of the other main must-see sites of this captivating city. Marta accompanied us back safely to the hotel via the Metro again after the tour was finished. This was the most disappointing tour I booked on viator. Our guidetook us to a boat where we were packed on with 30 or so other people and then the tour was conducted entirely in Russian. Our guide spoke over the loudspeaker in English, so we could barely hear her. Save your money!